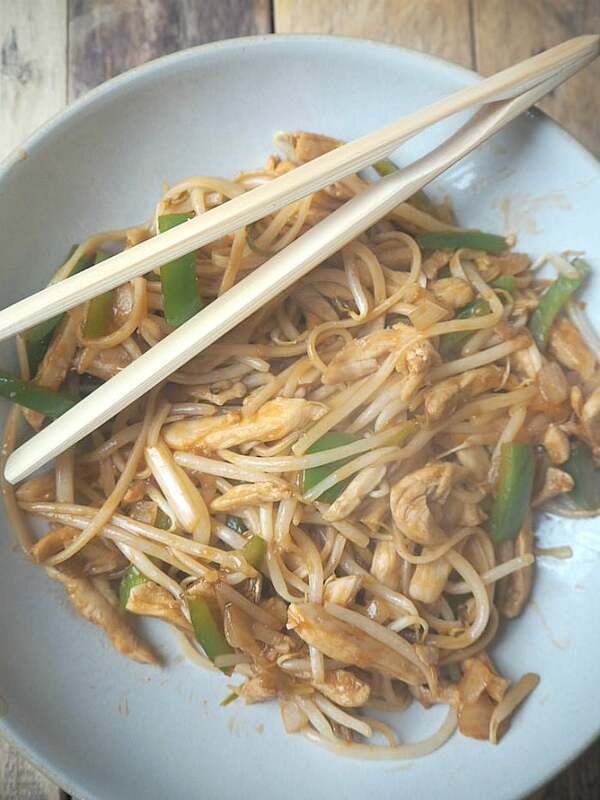 Last night we had our favourite fakeaway chicken chow mein for tea and as I was cooking it, it occurred to me that I’d never actually shared my recipe with you! So, since I’m a nice person (honest) and I don’t want you missing out on the chance to try this delicious meal I thought I’d share it with you today. 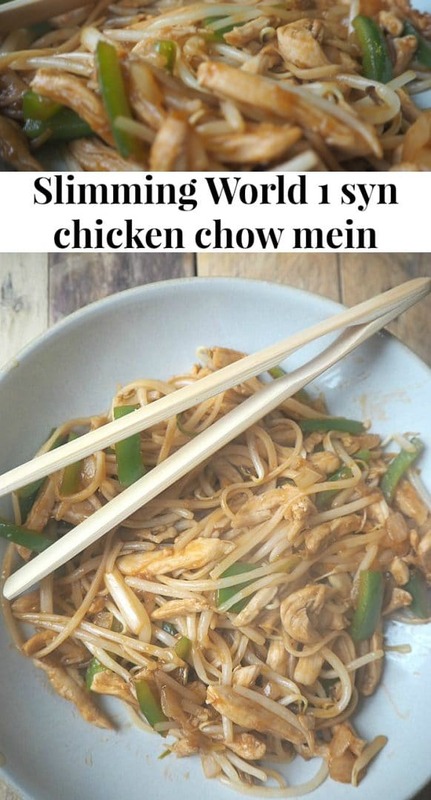 It’s great as a replacement for your local chinese takeaway to save some money but it’s also great for anyone who’s doing Slimming World as the only syns in the whole meal are for the tomato sauce which is 3 syns altogether – just divide that by the number of servings so for three people it would be 1 syn per meal which is amazing for this meal. As ever, do check that all of the brands you’re using are syn free as some noodles aren’t. This serves 2-3 people, depending on how hungry you are. 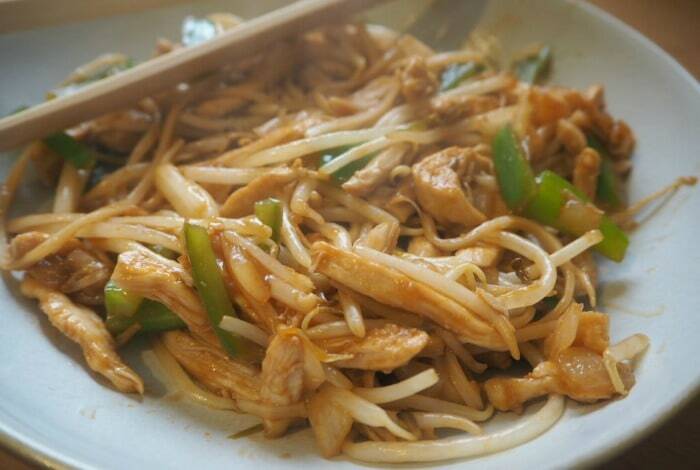 The secret to fakeaway chicken chow mein is all in the preparation so try to get everything prepared before you start cooking. 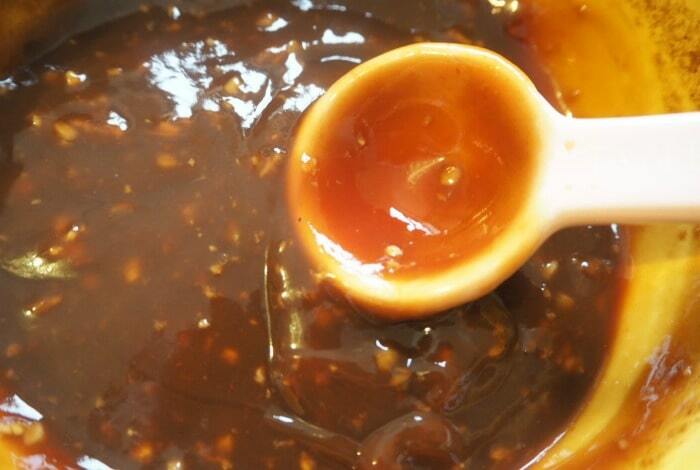 In a small bowl, mix the oyster sauce, ketchup, soy sauce, ginger and garlic together and then set that to one side to let the flavours develop. 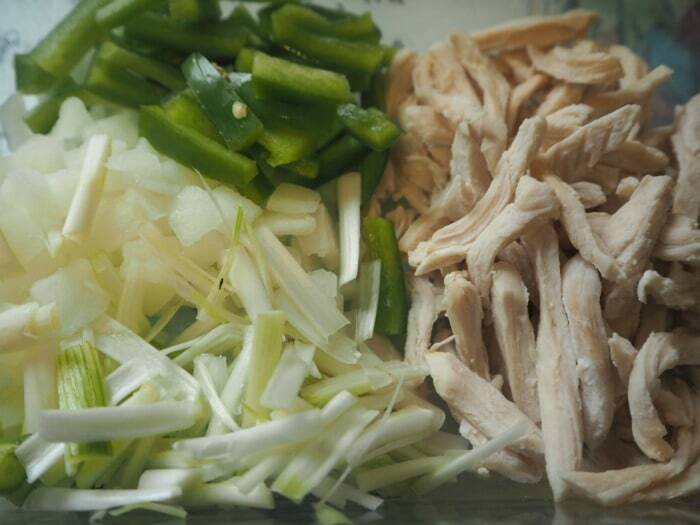 In a large dish add the chopped onion, chopped green pepper, cooked chicken, and spring onions. I prepare the spring onions by cutting down each one length-ways a few times and then slicing into strips. 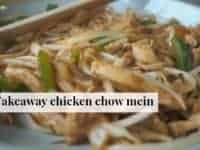 I use cooked chicken usually in my fakeaway chicken chow mein but if you’re using raw then don’t add it to the bowl with the rest of the ingredients at this stage. Next pop your noodles in a pan of boiling water and cook for the time stated on the packet (it usually says minus a minute’s cooking time if you’ll be using them in stir fries). Drain them and again set them to one side. Heat some olive oil (or spraylight if you’re on Slimming World) in a wok and at this point you would either add your raw chicken and cook until that’s cooked through before adding the onions, peppers and spring onions or if like me, you’re using cooked chicken you can just pop that in at the same time as the onions, peppers and spring onions. Just cook it until your chicken is heated through and then add the sauce. Give it a good mix and when the sauce is hot then add the beansprouts and noodles bit by bit making sure you keep stirring it so everything gets covered in the sauce. When the beansprouts have wilted a little and everything is coated in the sauce then you’re ready to serve. And so much cheaper than buying it at your local takeaway! 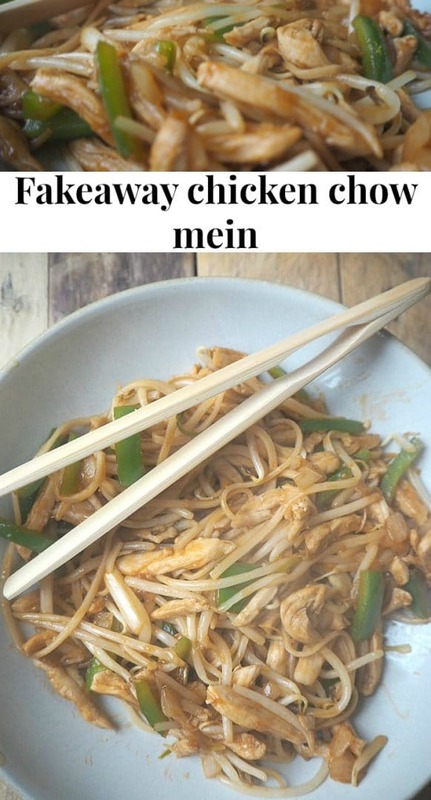 If you liked this recipe for Fakeaway chicken chow mein you can save it to your own recipe box if you use Yummly – just click on the YUM icon at the bottom of this post. I use cooked chicken usually in my fakeaway chicken chow mein but if you're using raw then don't add it to the bowl with the rest of the ingredients at this stage. Next pop your noodles in a pan of boiling water and cook for the time stated on the packet (it usually says minus a minute's cooking time if you'll be using them in stir fries). Drain them and again set them to one side. Heat some olive oil (or spraylight if you're on Slimming World) in a wok and at this point you would either add your raw chicken and cook until that's cooked through before adding the onions, peppers and spring onions or if like me, you're using cooked chicken you can just pop that in at the same time as the onions, peppers and spring onions. When the beansprouts have wilted a little and everything is coated in the sauce then you're ready to serve. I would like to reduce 2 kgs but it is very hard to do it. Every month, I try but I can not reach my goal. Reading your post, I think that I will follow your menu ideas since you already tested. "These are all recipes that we’ve tried and tested over the years and loved by us all, which is why they made it on my list of favourites – I love meals that are Slimming World friendly AND family friendly!" Made this with sweet potato spirals instead of noodles and the leftover pickings from a roast chicken carcass. It was delicious…this is a keeper, thanks! What kind of noodles. Yakisoba? Planning on making this tonight for my first day of my new diet, looks so yummy! Made this tonight as part of a healthy eating plan. Loved it. 4 clean plates! Oh yum. We are always looking for new recipes and this sounds and looks delicious. We will give it a try.